As we know, this is a very auspicious time of the year. It is stated in the Skanda Purana that all holy places reside in the month of Kartika, which is eternally dear to Lord Krishna. Whatever pious deeds one performs to please Lord Visnu during the month of Kartika brings a benefit that is eternal. 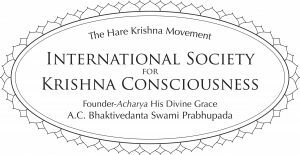 It is an excellent time to increase your devotional service, your hearing about Krishna, reading shastras and chanting the holy names. It is also a very auspicious time to contribute to seva at the Temple, especially Go Raksha Seva, Cow Protection! Every morning after Gurupuja at 7:30 a.m. and every evening after 6:30 p.m. arati, we will chant the Damodarastakam prayers in the Temple and give all the devotees present an opportunity to offer ghee wicks to Sri Sri Radha Shyamasunda, Sri Sri Gaura Nitai, and Sri Sri Krishna Balarama. Please join us at one of these two times to worship Lord Damodara during this auspicious month. If you would like the ghee lights sponsored in your name on any day during Kartika, please donate through the link below. We need help throughout the month making ghee wicks, we go through a few thousand in these 30 days. Please stop by the pujari room for supplies and instructions.